Manchester United have asked the Premier League to intervene in the wrangle over the proposed transfer of John Mikel Obi. The 18-year-old Nigerian is at the centre of an extraordinary tug of war between United and Chelsea. Obi is holed up in a London hotel, having refused to report for training with his club Lyn Oslo yesterday. His move to London forced Sir Alex Ferguson to abandon plans to visit the youngster in the Norwegian capital. Obi claims he was pressured into signing for United and Chelsea still believe they will land him. "I signed a contract with Manchester United and I didn't do that of my own free will. I was put into a lot of pressure to do that," Obi said. "And I was denied advice from my agent and people I trust and I didn't get much time to think about that. "I did something I did not want to do. Because of the pressure from Mr Morgan (Andersen, Lyn's sporting director) and a representative of United it became too much. "I was pushed and I had nobody on my side so I had to do it. I was denied a chance to have a week to think about it and get some independent advice from people so the pressure was too much." Mikel was asked if he had been in contact with Chelsea but he stressed: "No, I haven't. "I came into London and I have been in my hotel with my agent and haven't seen anyone or talked to anyone from Chelsea. I have no contact with Chelsea for now." Manchester United chief executive David Gill has expressed his surprise that the player was considering going elsewhere. "I am very disappointed. 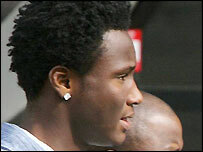 We have written to another club (about Mikel) but they have not responded to our letters," he told MUTV. "We have shown due deference to them, explaining the situation. We have sent copies to the Premier League and we will see the outcome." Gill displayed the player's contract documents on United's TV station as proof Mikel will come to Old Trafford when he leaves Lyn. "We did a deal with the club, quite properly, following the rules," he said. "We also did a deal with John Obi. He has turned 18 and turned professional. But in order to play in the Premier League he needs a work permit. "That is the process we have gone through. We have the rights to the player. "We have an option agreement with John Obi. There are two documents here which really show what we have, so we have the rights to the player in our opinion. "It was all done legally, done in accordance with Fifa transfer rules, and we are very comfortable with it,"
Lyn Sporting director Morgan Andersen said: "Why leave suddenly? Why not tell the club you are contracted to? "The boys who live with John could see he was scared. He was crying. I feel really bad for John, he has to protect himself and his family in Nigeria. "The agents tried to influence him to say he didn't want to play for Manchester United. "He didn't want to do that but he he said he was under great pressure from those people."